The Index opened strong around 7924 and stayed strong throughout the entire session of trade to close near the top at 7948.90, huge gain of 105.60 points. The broader market was also positive, with 1019 advances to 482 declines. The range for the series stays at 7500-8300. Call option 8000-8300 added 5.17 lacs OI with short covering seen at 7900 and below strike prices. Put option 8000-7500 added huge 13.90 lacs OI with profit booking seen at 7400 and below strike prices. 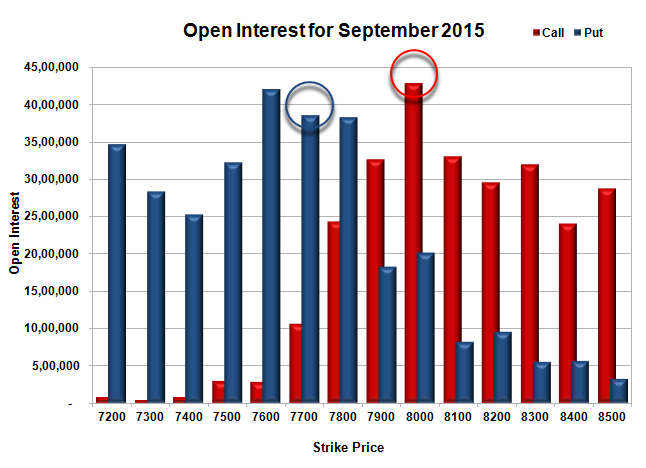 Nifty Open Interest is at 1,86,53,575 down by 1,71,325, with increase in price, most probably short covering. 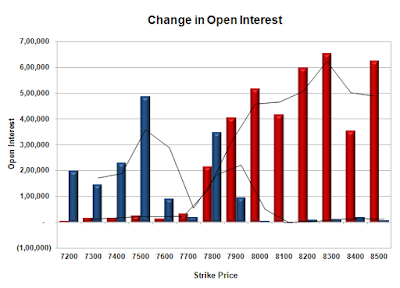 Bank Nifty Open Interest is at 26,08,650 up by 57,425, with decrease in price, most probably short build-up. 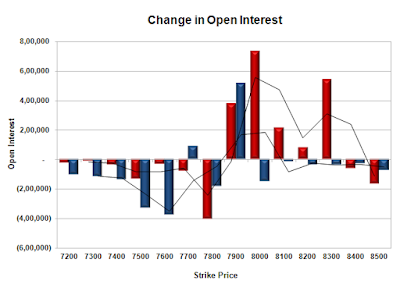 FII’s sold 0.50 lacs Futures, which includes 2995 contracts long build-up and 4986 contracts short build-up, with increase in net OI by 7981 contracts (includes 72404 longs to 74395 shorts for the day) and the Average Price comes to 8443.53. FII’s Index future open contract as on date is 435191 Longs to 349236 Shorts, Net Long 85955 down by 1991 contracts. 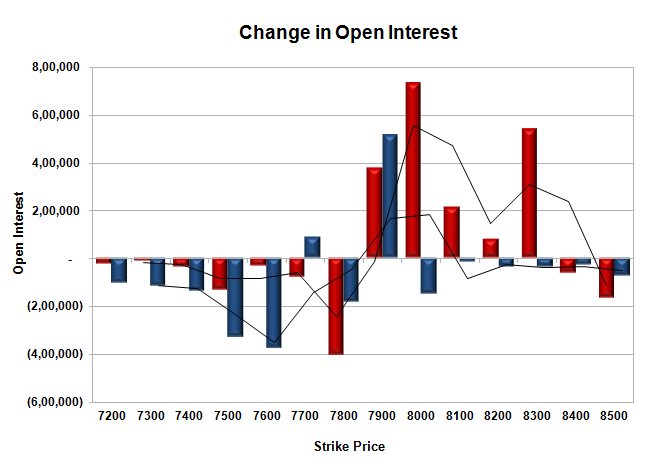 Initial support up at 7900, with OI of 19.90 lacs and below that at 7800 with OI of 36.17 lacs. Initial resistance at 8000, with OI of 39.14 lacs and above that at 8200 with OI of 36.90 lacs. 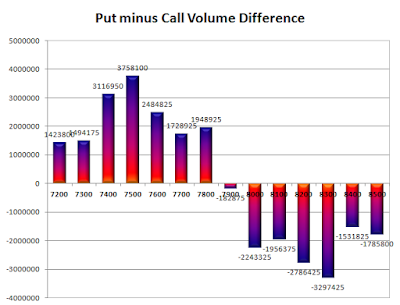 Day Range as per Option Table is 7828 - 8035 and as per VIX is 7867 - 8031 with 7927 as the Pivot. The Index opened weak at 7725 and went on to touch the lows at 7691, but a 50 bps rate cut saw the index gallop away to the high of the day around 7933 but closed much lower at 7843.30, gain of 47.60 points. The broader market though was negative, with 672 advances to 807 declines. The range for the series stays at 7500-8300. 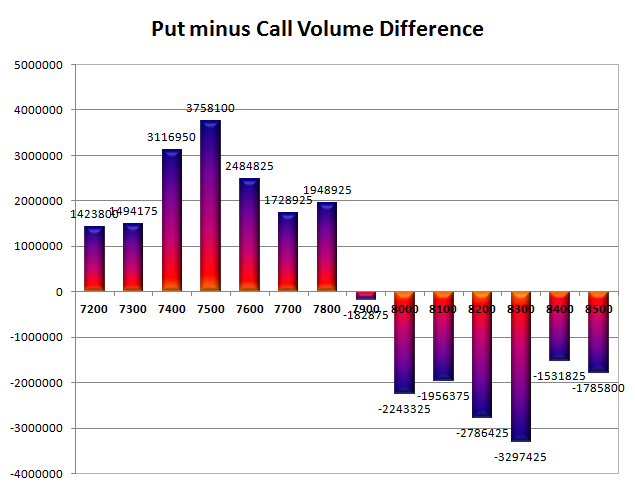 Call option 7400-8300 added huge 33.03 lacs OI with small profit booking seen at 8400 strike price. 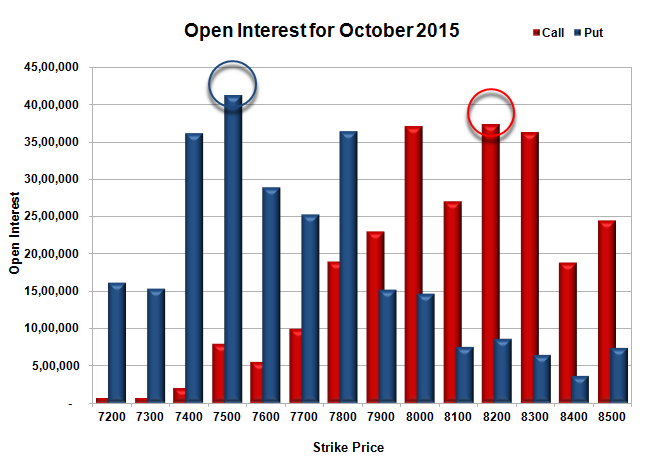 Put option 8000-7200 added huge 27.83 lacs OI with short covering seen at 8100 and above strike prices. Nifty Open Interest is at 1,88,24,900 up by 2,25,850, with increase in price, most probably long build-up. 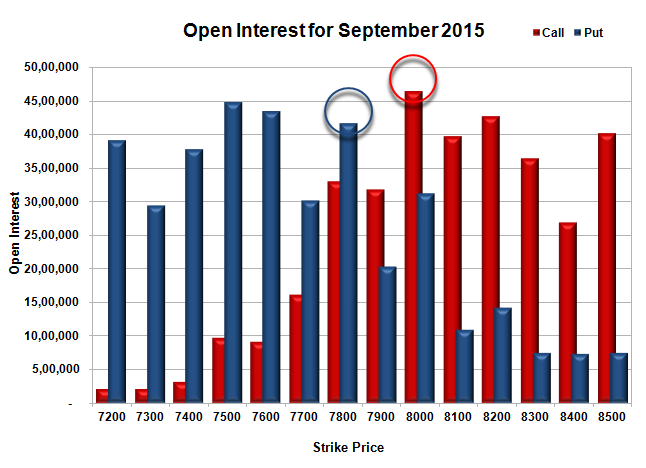 Bank Nifty Open Interest is at 25,51,225 up by 3,56,250, with increase in price, most probably huge long build-up. FII’s sold 7.66 lacs Futures, which includes 12632 contracts long liquidation and 17992 contracts short build-up, with increase in net OI by 5360 contracts (includes 97908 longs to 128532 shorts for the day) and the Average Price comes to 8395.48. FII’s Index future open contract as on date is 432196 Longs to 344250 Shorts, Net Long 87946 down by 30624 contracts. 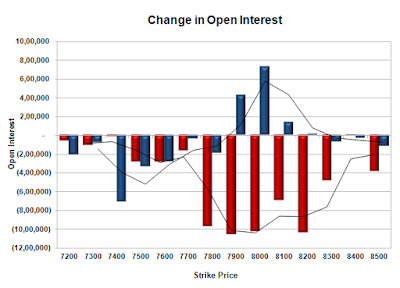 Initial support stays at 7800, with OI of 36.45 lacs and below that at 7500 with OI of 41.20 lacs. 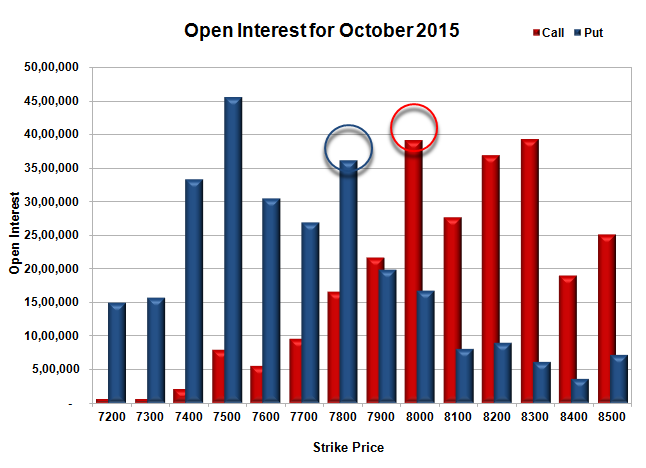 Initial resistance at 8000, with OI of 37.02 lacs and above that at 8200 with OI of 37.35 lacs. 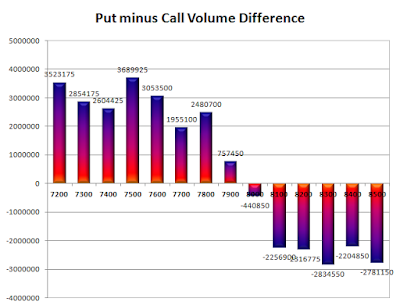 Day Range as per Option Table is 7720 - 7933 and as per VIX is 7755 - 7932 with 7820 as the Pivot. The Index opened flat to positive and stayed in a narrow range but saw huge sell-off in the last hour of trade to close near the lowest point at 7795.70, huge loss of 72.80 points. The broader market was also negative, with 574 advances to 931 declines. The broader range at the start of the series comes to 7500-8300. Call option 7500-8500 added huge 37.77 lacs OI. 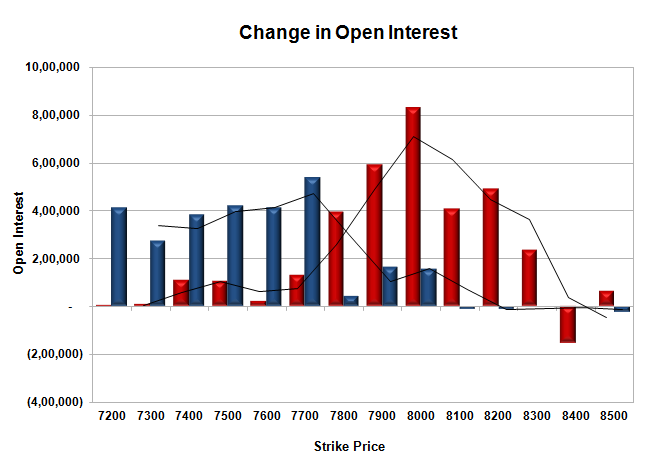 Put option 7900-7200 added huge 16.12 lacs OI with short covering seen at 8100 strike price. 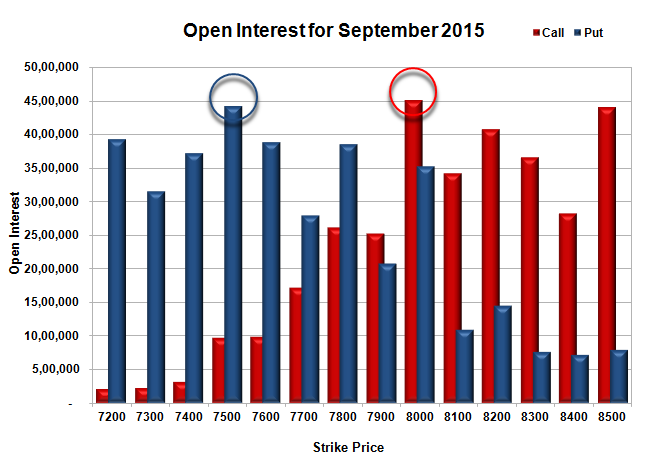 Nifty Open Interest is at 1,85,99,050 up by 2,30,650, with decrease in price, most probably short build-up. Bank Nifty Open Interest is at 21,94,975 down by 4,525, with decrease in price, most probably small long liquidation. 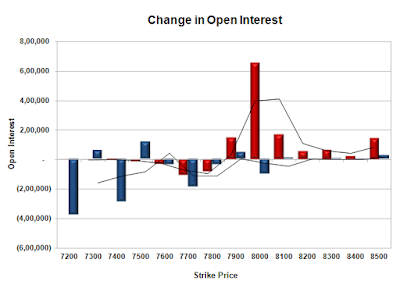 FII’s sold 0.21 lacs Futures, which includes 3901 contracts long build-up and 4728 contracts short build-up, with increase in net OI by 8629 contracts (includes 36859 longs to 37686 shorts for the day) and the Average Price comes to 8189.35. 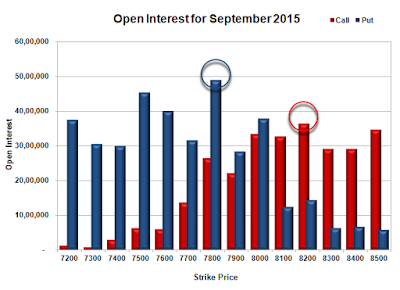 FII’s Index future open contract as on date is 444828 Longs to 326258 Shorts, Net Long 118570 down by 827 contracts. 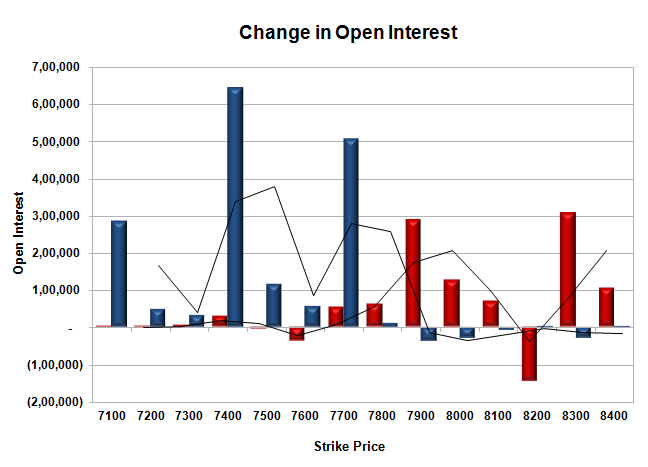 Initial and best support stays at 7800, with OI of 36.03 lacs and below that at 7500 with OI of 37.03 lacs. 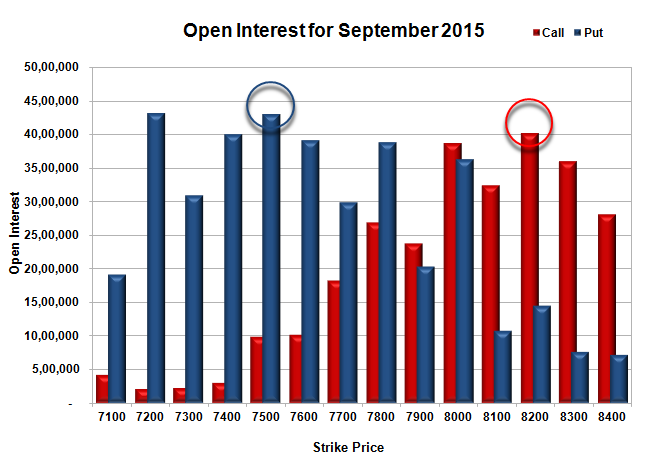 Initial resistance at 8000, with OI of 28.74 lacs and above that at 8200 with OI of 32.45 lacs. Day Range as per Option Table is 7723 - 7915 and as per VIX is 7707 - 7884 with 7826 as the Pivot. The Index opened flat to weak and went on to make a low of 7804 within the first few minutes. Buying at lower coupled with short covering saw the index closed in green at 7868.50, gain of 22.55 points. The broader market was also positive, with 809 advances to 690 declines. The broader range at the start of the series comes to 7500-8300. Call option 7500-8500 added huge 28.57 lacs OI. Put option 8500-7200 added huge 48.30 lacs OI. Nifty Open Interest is at 1,83,68,400 up by 38,55,100, with increase in price, most probably 100% roll-over with small long build-up. Bank Nifty Open Interest is at 21,99,500 up by 5,82,325, with decrease in price, most probably roll-over with small long liquidation. FII’s sold 6.53 lacs Futures, which includes 388648 contracts long liquidation and 363629 contracts short covering, with decrease in net OI by 752277 contracts (includes 223390 longs to 249509 shorts for the day) and the Average Price comes to 8284.57. FII’s Index future open contract as on date is 440927 Longs to 321530 Shorts, Net Long 119397 down by 25019 contracts. Initial and best support at 7800, with OI of 32.56 lacs and below that at 7500 with OI of 32.18 lacs. Initial resistance at 8000, with OI of 23.59 lacs and above that at 8200 with OI of 26.48 lacs. 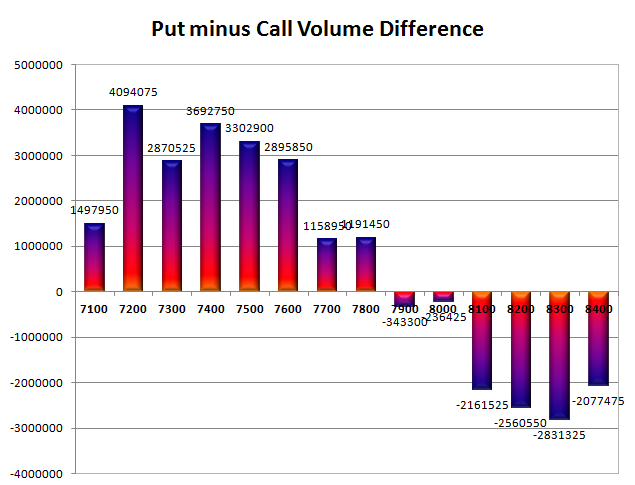 Day Range as per Option Table is 7760 - 7959 and as per VIX is 7783 - 7954 with 7856 as the Pivot. The Index opened weak around 7737 and went on make low at 7723, but sustained buying/short covering saw the index close back in green at 7845.95, gain of 33.95 points. The broader market was also positive, with 848 advances to 632 declines. The broader range for expiry has come down to 7700-8000. 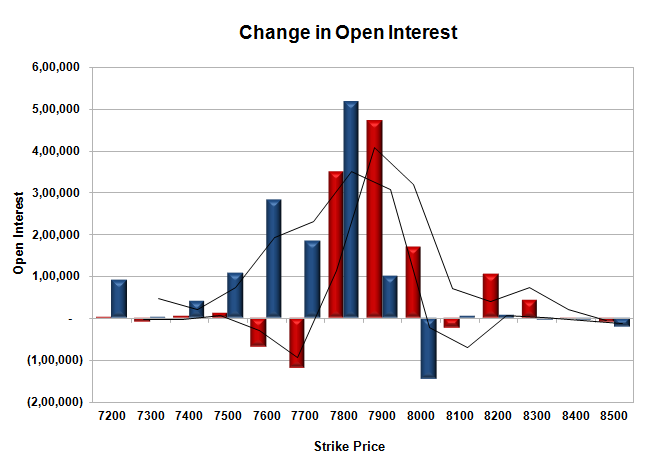 Call option 7900-8000 added 2.75 lacs OI with short covering seen at 7800 and below strike prices. 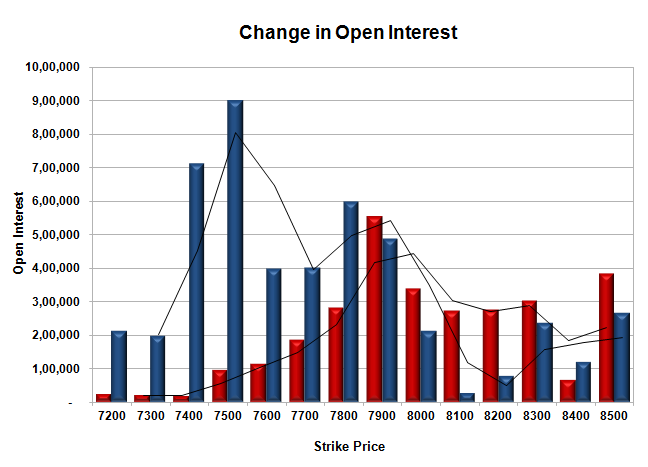 Put option 7700-7600 added 11.86 lacs OI with short covering seen at 7800 and above strike prices. Nifty Open Interest is at 1,53,49,300 down by 24,17,400, whereas Oct series added 22.62 lacs with increase in price, most probably roll-over with small short covering. Bank Nifty Open Interest is at 17,04,275 down by 2,86,125, whereas Oct series added 6.24 lacs with increase in price, most probably 100% roll-over with huge long build-up. FII’s sold 1.50 lacs Futures, which includes 13362 contracts long build-up and 19350 contracts short build-up, with increase in net OI by 32712 contracts (includes 247297 longs to 253285 shorts for the day) and the Average Price comes to 8144.38. FII’s Index future open contract as on date is 829575 Longs to 685159 Shorts, Net Long 144416 down by huge 5988 contracts. 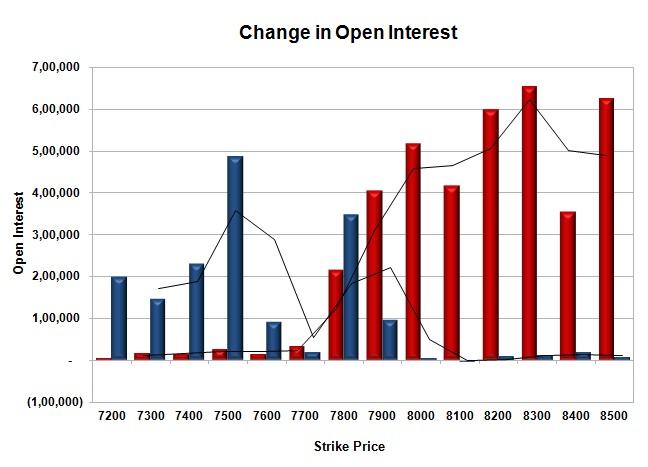 Initial support at 7800, with OI of 38.32 lacs and below that at 7700 with OI of 38.61 lacs. Initial resistance at 7900, with OI of 32.66 lacs and above that at 8000 with OI of 42.85 lacs. Day Range as per Option Table is 7721 - 7929 and as per VIX is 7761 - 7931 with 7817 as the Pivot. The Index opened strong but after staying in a narrow range for the better part of first half saw huge sell-off to break one support after another and closed near the lows at 7812.00, huge loss of 165.10 points. The broader market was also weak, with 430 advances to 1075 declines. The broader range till expiry has come down to 7600-8100. 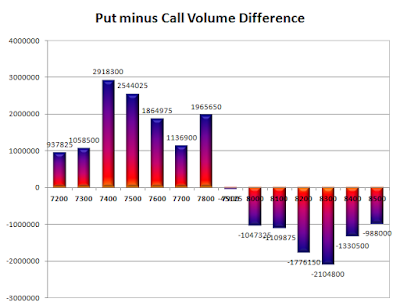 Call option 7800-8100 added huge 18.61 lacs OI with profit booking seen at 8200 and above strike prices. 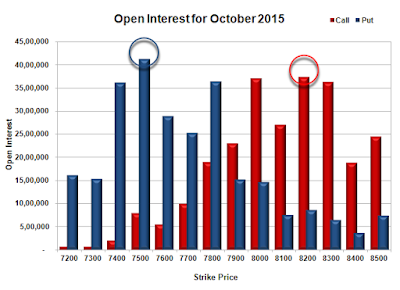 Put option 7800, 7600 added 3.07 lacs OI with short covering seen at 7900 and above strike prices. Nifty Open Interest is at 1,77,66,700 down by 13,50,250, whereas Oct series added 54.62 lacs with decrease in price, most probably 100% roll-over with huge short build-up. Bank Nifty Open Interest is at 19,90,400 down by 3,82,975, whereas Oct series added 6.07 lacs with decrease in price, most probably 100% roll-over with huge short build-up. FII’s sold huge 9.00 lacs Futures, which includes 80482 contracts long build-up and 116478 contracts short build-up, with increase in net OI by 196960 contracts (includes 439439 longs to 475435 shorts for the day) and the Average Price comes to 8006.43. FII’s Index future open contract as on date is 816213 Longs to 665809 Shorts, Net Long 150404 down by huge 35996 contracts. 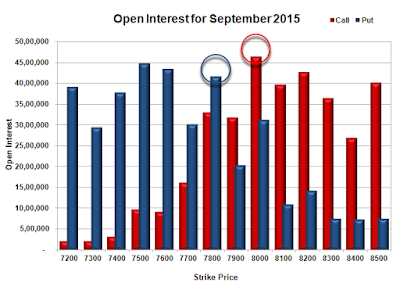 Initial and best support still at 7800, with OI of 49.43 lacs and below that at 7700 with OI of 31.89 lacs. 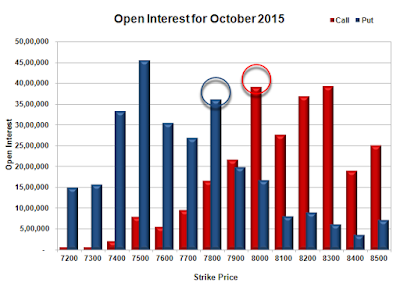 Initial resistance at 7900, with OI of 30.33 lacs and above that at 8000 with OI of 42.43 lacs. 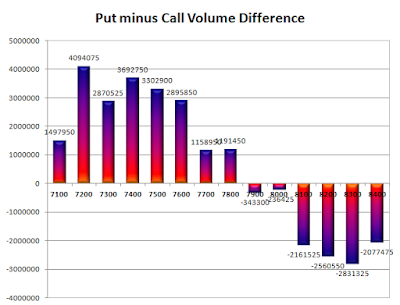 Day Range as per Option Table is 7755 - 7961 and as per VIX is 7729 - 7895 with 7874 as the Pivot. The Index opened weak around 7900 level but say sustained buying from the open itself to move back in green but closed flat at 7977.10, small loss of 4.80 points. The broader market though was strong, with 961 advances to 538 declines. The broader range till expiry has boiled down to 7800-8100. 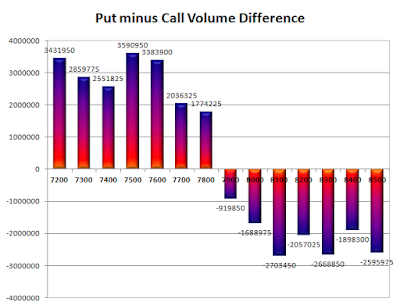 Call option 7900-8300 added huge 19.46 lacs OI with short covering seen at 7800 and lower strike prices. 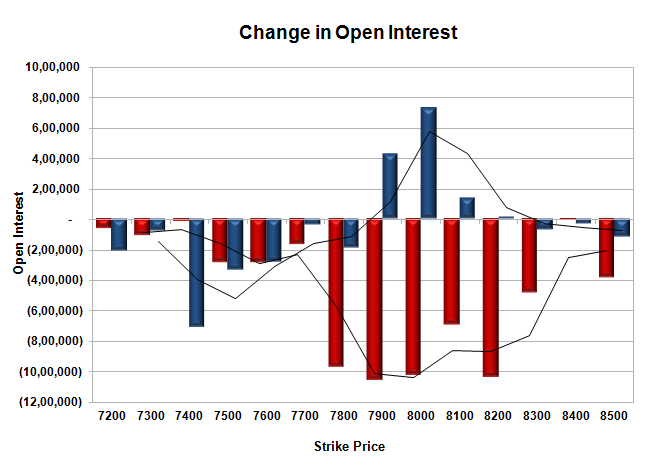 Put option 7900, 7700 added 6.05 lacs OI with profit booking seen at 7600 and below strike prices. 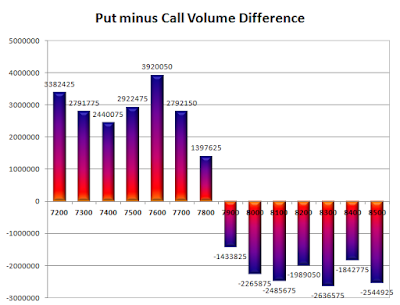 Nifty Open Interest is at 1,91,16,950 down by 27,35,100, whereas Oct series also added 37.83 lacs with no change in price, most probably 100% roll-over with huge short/long build-up. 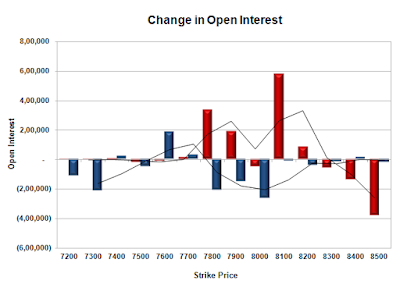 Bank Nifty Open Interest is at 23,73,375 down by 9,475, whereas Oct series also added 1.70 lacs with increase in price, most probably 100% roll-over with huge long build-up. FII’s sold huge 21.94 lacs Futures (but why? 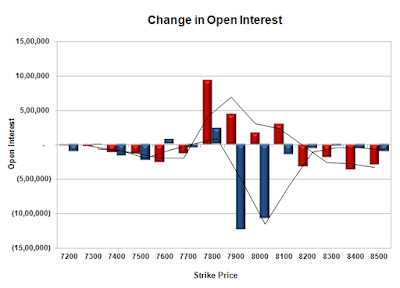 ), which includes 10776 contracts long build-up and 98537 contracts short build-up, with increase in net OI by 109313 contracts (includes 245228 longs to 332989 shorts for the day) and the Average Price comes to 8220.62. FII’s Index future open contract as on date is 735731 Longs to 549331 Shorts, Net Long 186400 down by huge 87761 contracts. Initial support still at 7900, with OI of 33.44 lacs and below that at 7800 with highest OI of 47.09 lacs. Initial and best resistance at 8000, with OI of 40.68 lacs and above that at 8100 with OI of 34.77 lacs. 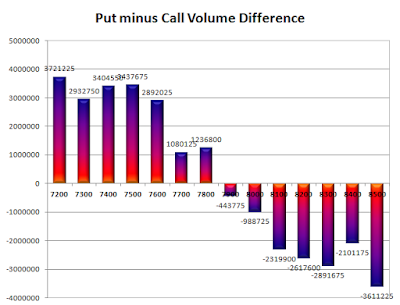 Day Range as per Option Table is 7870 - 8056 and as per VIX is 7901 - 8053 with 7958 as the Pivot. The Index opened strong around 7887 and stayed in a narrow range, scaling 7900 with ease but closed just lower at 7899.15, huge gain of 70.05 points. The broader market though was weak, with 717 advances to 779 declines. The broader range for the series is now at 7600-8200. 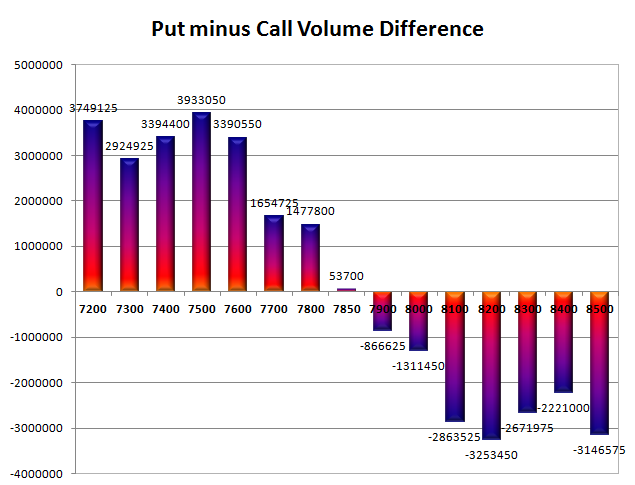 Call option 7800, 8200, 8400 added 9.61 lacs OI with profit booking seen at 8300 and above strike prices. Put option 7900-7500 added huge 18.05 lacs OI with profit booking seen at 7600 and 7400 strike prices. 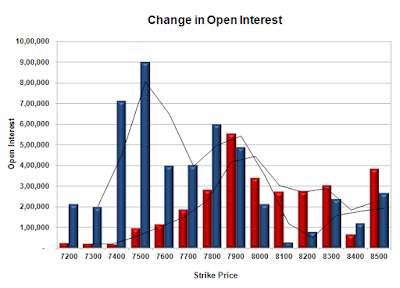 Nifty Open Interest is at 2,15,54,700 down by 6,88,400, whereas Oct series added 1.77 lacs with increase in price, most probably small roll-over with huge short covering. Bank Nifty Open Interest is at 23,55,375 down by 1,54,500, whereas Oct series added just 0.11 lacs with increase in price, most probably huge short covering. FII’s sold 0.35 lacs Futures, which includes 16757 contracts long liquidation and 15375 contracts short covering, with decrease in net OI by 32132 contracts (includes 72048 longs to 73430 shorts for the day) and the Average Price comes to 8197.51. 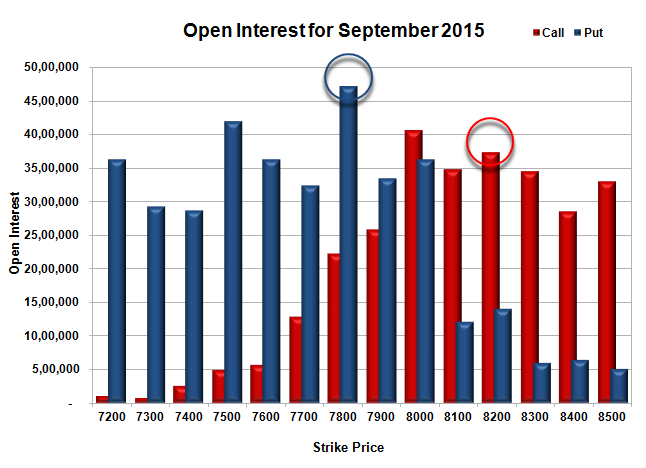 FII’s Index future open contract as on date is 661780 Longs to 380900 Shorts, Net Long 280880 down by 1382 contracts. 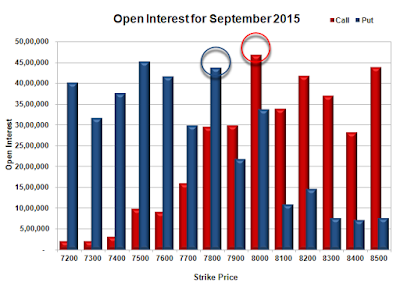 Initial and best support at 7800, with highest OI of 50.80 lacs and below that at 7600 with OI of 42.79 lacs. 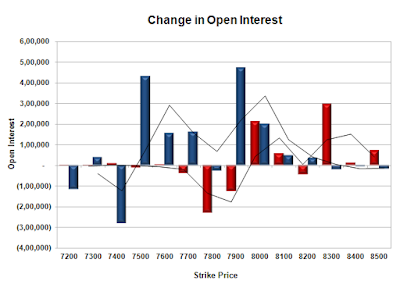 Initial resistance still at 7900, with OI of 32.64 lacs and above that at 8000 with OI of 43.59 lacs. Day Range as per Option Table is 7795 - 7987 and as per VIX is 7808 - 7990 with 7889 as the Pivot. The Index opened flat and after making the initial high saw profit booking to make a low around 7800, but closed just up at 7829.10, loss of 43.15 points. The broader market was weak, with 534 advances to 969 declines. The broader range for the series has narrowed down to 7600-8100. Call option 7800-8200 added huge 11.39 lacs OI with profit booking seen at 8300 and above strike prices. 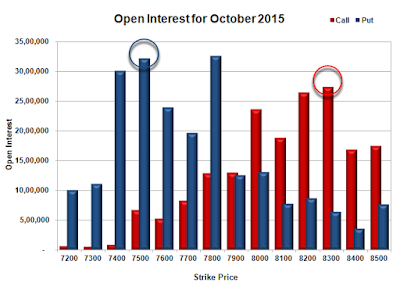 Put option 7700-7600 added 2.12 lacs OI with short covering seen at 7800 and above strike prices. Nifty Open Interest is at 2,22,43,100 down by 81,675, with decrease in price, most probably long liquidation. 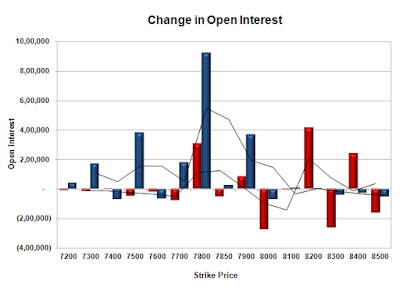 Bank Nifty Open Interest is at 25,09,875 down by 57,450, with decrease in price, most probably huge long liquidation. FII’s bought 2.65 lacs Futures, which includes 18176 contracts long build-up and 7573 contracts short build-up, with increase in net OI by 25749 contracts (includes 76021 longs to 65418 shorts for the day) and the Average Price comes to 8115.13. 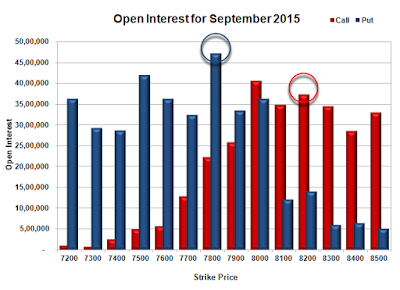 FII’s Index future open contract as on date is 678537 Longs to 396275 Shorts, Net Long 282262 up by 10603 contracts. 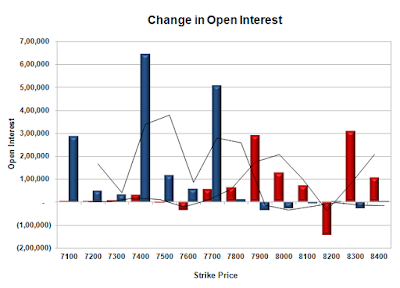 Initial support stays at 7800, with OI of 41.61 lacs and below that at 7600 with OI of 43.45 lacs. 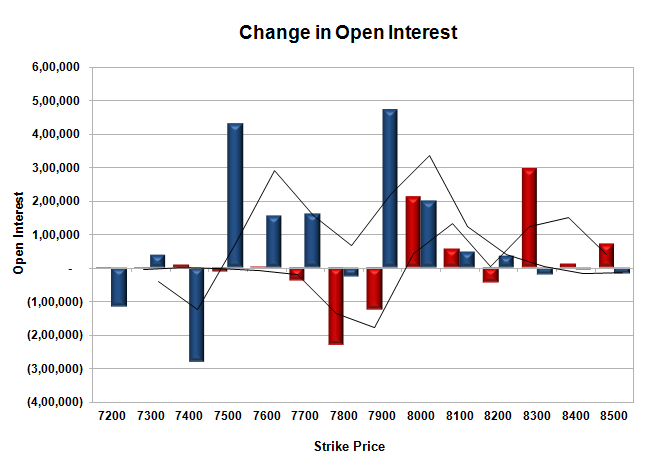 Initial resistance at 7900, with OI of 31.79 lacs and above that at 8000 with OI of 46.36 lacs. 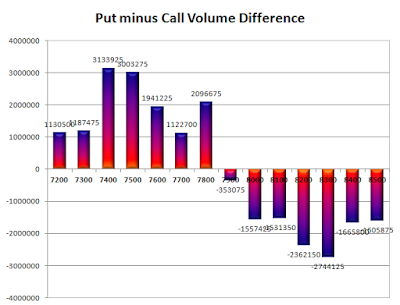 Day Range as per Option Table is 7733 - 7936 and as per VIX is 7732 - 7926 with 7836 as the Pivot. The Index opened huge gap-up around 7834 and after making an initial high at 7865 but drifted lower with each passing hour to close flat at 7789.30, miniscule gain of 1.20 points. The broader market was positive, with 898 advances to 594 declines. The broader range for the series stays at 7500-8200. 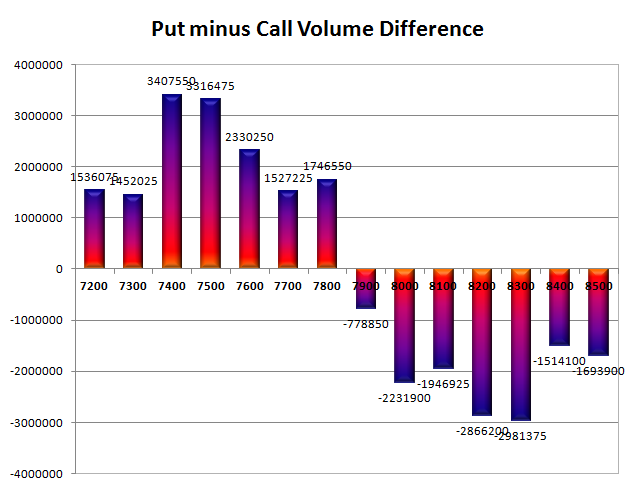 Call option 7900-8500 added huge 12.55 lacs OI with short covering seen at 7800 and below strike prices. 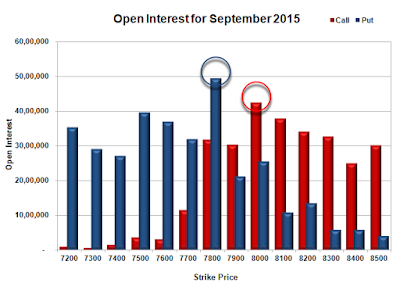 Put option 7500, 7300 added 1.78 lacs OI with short covering seen at 8000 and above strike prices. 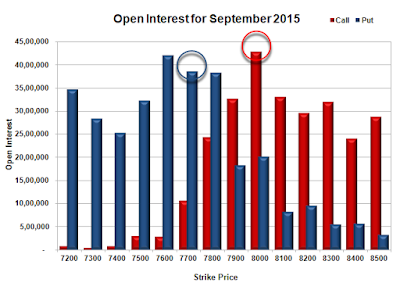 Nifty Open Interest is at 2,26,72,600 down by 55,200, with decrease in price, most probably long liquidation. Bank Nifty Open Interest is at 24,32,200 down by 1,07,250, with decrease in price, most probably long liquidation. FII’s bought 1.73 lacs Futures, which includes 11604 contracts long build-up and 4674 contracts short build-up, with increase in net OI by 16278 contracts (includes 99287 longs to 92357 shorts for the day) and the Average Price comes to 8014.47. 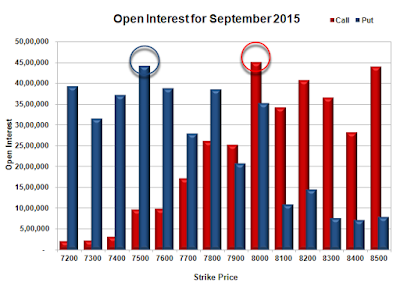 FII’s Index future open contract as on date is 674103 Longs to 390998 Shorts, Net Long 283105 up by 6930 contracts. Initial support stays at 7800, with OI of 38.50 lacs and below that at 7600 with OI of 38.81 lacs. 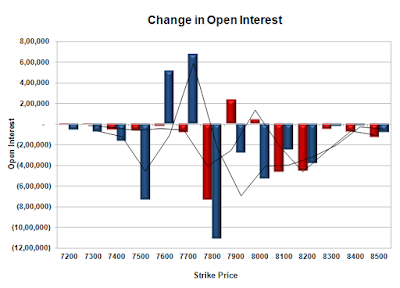 Initial resistance at 7900, with OI of 25.20 lacs and above that at 8000 with OI of 45.15 lacs. Day Range as per Option Table is 7688 - 7914 and as per VIX is 7687 - 7891 with 7805 as the Pivot. The Index opened huge gap-gown around 7729 and went on to make a low of 7678.50, but the responsive buyers took control to move the index back in green above 7800 but was adjusted lower at 7788.10, loss of 30.50 points. The broader market was also negative, with 554 advances to 940 declines. The broader range for the series stays at 7500-8200. Call option 7900-8100, 8300-8400 added huge 9.03 lacs OI with profit booking seen at 8200 strike price. Put option 7700-7100 added huge 16.92 lacs OI with small short covering seen at 7900 and above strike prices. 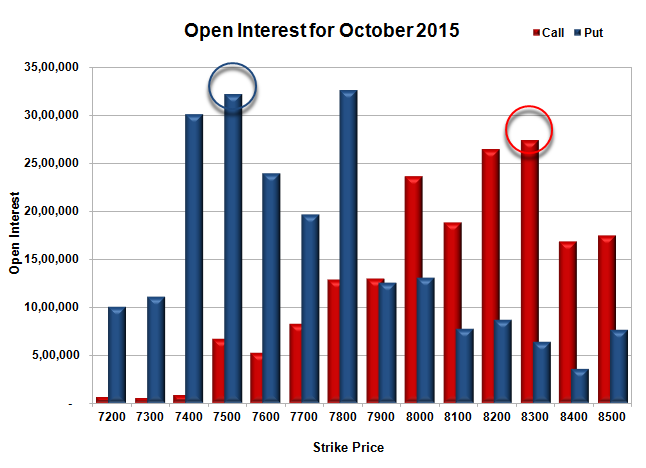 Nifty Open Interest is at 2,27,27,800 up by 4,73,775, with decrease in price, most probably huge short build-up. 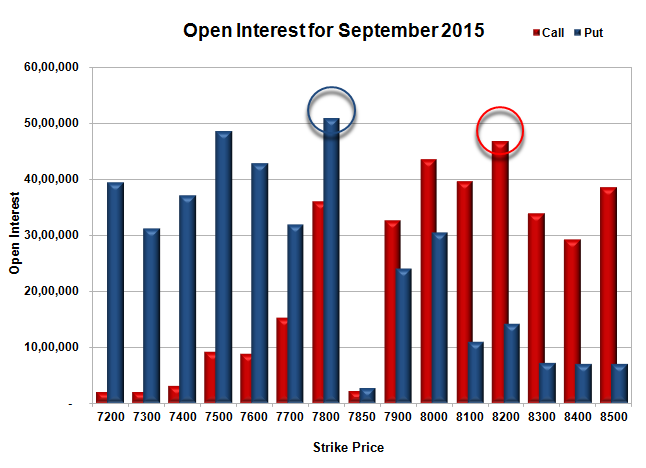 Bank Nifty Open Interest is at 25,39,450 up by 1,23,025, with decrease in price, most probably short build-up. FII’s sold 3.81 lacs Futures, which includes 11594 contracts long build-up and 26839 contracts short build-up, with increase in net OI by 38433 contracts (includes 81804 longs to 97049 shorts for the day) and the Average Price comes to 8038.73. FII’s Index future open contract as on date is 662499 Longs to 386324 Shorts, Net Long 276175 down by 15245 contracts. 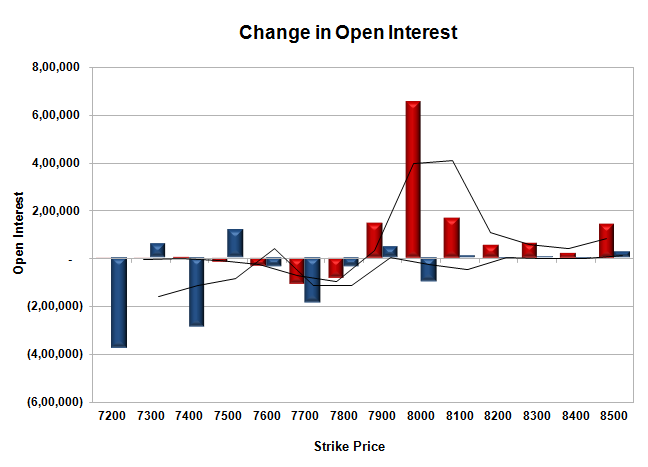 Initial support stays at 7800, with OI of 38.88 lacs and below that at 7600 with OI of 39.17 lacs. Initial resistance at 7900, with OI of 23.72 lacs and above that at 8000 with OI of 38.63 lacs. 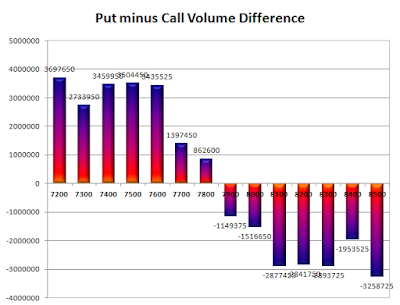 Day Range as per Option Table is 7651 - 7890 and as per VIX is 7687 - 7889 with 7762 as the Pivot.